Jamie Roberts believes Wales' passion for the red jersey shone through with their first win over France in Paris since 2005. Roberts, who spoke with real emotion and was on the brink of tears after the game, celebrated his 50th Wales cap with a vital win. 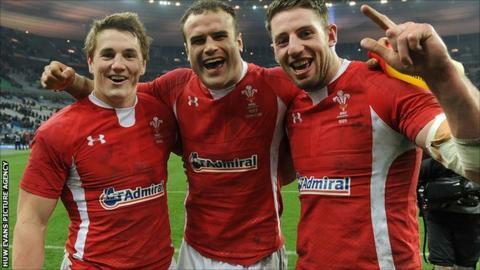 Wales ended a run of eights straight defeats with their 16-6 win at Stade de France. "We have come in for a lot of stick over the last year," said Roberts.
" A lot of things go into the game of rugby and one of them, which was lacking in the first half-hour last weekend, is passion. "The passion in defence... was there." A solitary try by wing George North saw Wales finally end a their eight-match losing streak and put their Six Nations campaign back on track. Full-back Leigh halfpenny landed three penalties and a conversion and was awarded the man of the match award for his performance at Stade de France. Wales, who had come into the tournament as reigning Grand Slam champions, suffered a 30-22 defeat to Ireland at the Millennium Stadium in the Six Nations opener. Roberts revealed how much the players and interim Wales coach Rob Howley had been stung by the criticism of last weekend's display and their run of eight defeats. "Too right we came in for a lot of stick last week, because it wasn't good enough," said Roberts. "We had to put that right and we showed that from the off against France. We showed that heart and effort to get off our line and defend and cut them off. "All of that was hugely important and our class showed in attack then." While Roberts hailed the huge defensive effort by his teammates, he also paid tribute to the team ethic which had seen them through in the French capital. "This isn't about individuals but about the team," said Roberts. "It's about how we play as a unit. "We will analyse the game and their will be things to work on, but the result is what we desperately needed and we got that. "It's a great place to win."